Currently, there are five species of pea crabs in European waters. In the context of the AFROBIV project, in which the effect of the African pea crab Afropinnotheres monodi on bivalve species of commercial interest is being studied, a sampling campaign has been carried out on bivalve species of the coasts of southwestern Europe. The results of this campaign are used in the present study to evaluate the current distribution of A. monodi and its degree of infestation in its various hosts, together with the distribution of native European pinnotherid species. Previously collected information has also been reviewed and included with the present results to establish a baseline so as to enable future changes in distribution and host use of European pinnotherid species to be compared and quantified. To enable the more accurate identification of species and detection of new species in the area, three genetic markers (16S, Cox1, and H3) for the current five European pinnotherid species have also been compiled from Genbank or obtained in the present work. The results showed the high abundance of A. monodi in a significant portion of the area studied. In contrast, few specimens of the native Pinnotheres pectunculi and P. pisum were collected. 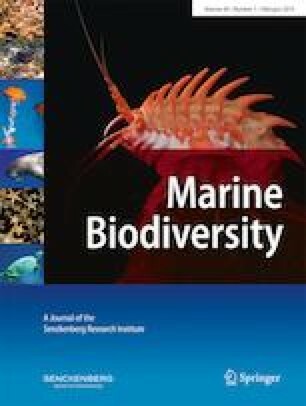 The northern limit of the current distribution of A. monodi extends to the Sado estuary (Portugal), and the species has been recorded for the first time in the Mediterranean (Alboran Sea). New records of P. pectunculi in the Alboran Sea confirm the presence of this species in the Mediterranean, and considerably expand the known distribution of the species, until now restricted to the coasts of Brittany. This study was partially funded by the Spanish “Ministerio de Economía y Competitividad (MINECO), Plan Nacional I+D” and the European FEDER funds through project AFROBIV (CGL2014–53557-P). The MINECO also supported a FPI PhD contract to MPM (BES-2015-072703). We want to thanks “Consejería de Agricultura, Pesca y Desarrollo Rural” and “Consejería de Medio Ambiente y Ordenación del Territorio” of Junta de Andalucía by supporting the development of AFROBIV project. We are grateful to Antonio Moreno and David Roque (ICMAN-OPECAM), Juan M. Rodríguez, Francisco Pereira (IFAPA), Manuela Morillo, Manuel A. Prado, Manuel Peña and David Hernández (AGAPA) and Angel Mateo (UMA) by for their assistance in samplings; and Carlos Sánchez (ICMAN), and Mª Inmaculada Garrido and Alicia S. Naranjo (IFAPA) by laboratory work. Thanks are also due to Dr. Florbella Soares and Márcio Moreira (IPMA) by help in getting Portuguese samples, and Luis Manuel Cousido (Mejillón de Isla Cristina S.L. and Mejillones de Huelva S.L.) by samples of M. galloprovincialis from mussels’ long lines. We are also grateful to Dr. Sammy De Grave and two anonymous reviewers for their helpful and interesting comments that clearly improve the quality of the manuscript. We thank Royston Snart for the linguistic revision of the English text.